Whether out of inspiration or desperation, our desire to grow mentally and emotionally is part of our life, part of evolution. However, problems may arise when skills are needed but absent. This book, along with the accompanying audio instructions, contains all you need to develop invaluable mental, emotional and behavioral skills – skills that we don’t inherit or learn through reading or observing others, no matter how blessed we may have been with kind and mindful parents and grandparents. The step-by-step experiential approach will expand your understanding of your experiences and those of others. You will witness rapid change, day after day, within a few weeks. Across countries and cultures, people of all ages (from about age 7), even those with severe and often chronic mental health problems, report remarkable benefits in a relatively short period of time. Stage 1 will teach you mindfulness skills to notice and let go of unhelpful thoughts and emotions in order to address life’s challenges successfully. Here you will develop deep insight and equanimity, and realize that you don’t have to be prey to every thought that enters your mind and every emotion that you feel. During Stage 2, you will learn to apply these self-regulation skills in situations that you might be avoiding, which will result in an increase in self-confidence. In Stage 3, you will learn to develop better interpersonal understanding and communication skills in the face of tense situations with people, and learn to not react to others’ reactivity. With Stage 4, you will learn to increase your capacity to be kind to yourself and compassionate with others in your daily actions, leading to a greater sense of self-worth and a deep sense of care and connectedness with people. These four steps can be truly miraculous, regardless of your situation, education, profession, religion, or cultural background. For more detailed information on the four steps, click here. Does the world need another book on Mindfulness? “For those of us who have read Bruno Cayoun’s book, Mindfulness-integrated CBT for Well-being and Personal Growth, it’s a ‘no brainer’! 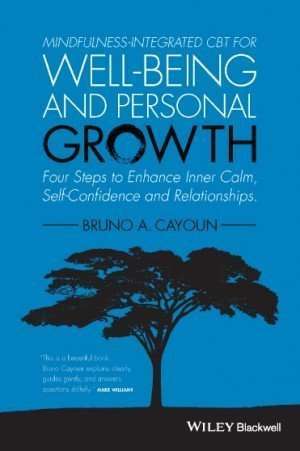 Bruno draws on his depth of experience as a person and psychologist to lead us through a journey towards wellbeing; a gift for all of us who wish to move towards a more enlightened life”, says Karen Clark, a 2014 Australian Professional Teachers Association’s award winner.